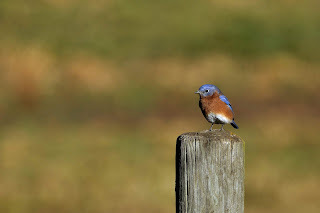 As far as I can tell right now this is the last bluebird post of the season. I say it is the last as far as I know because I love going out to shoot these guys and I might still have a chance to shoot them again. It has been so warm out that they have not migrated south. Some bluebirds stay year around in NE anyway. Most fly a little south of here. But most come back by Feb. anyway. Thought you might enjoy this little guy. The key here - a good background.